Collisionless shocks are of great interest in space physics, plasma physics, and astrophysics. In the shock transition, the bulk energy of plasma is converted into thermal energy in the absence of particle collisions. The shock is also thought to be an important source of high-energy particles (e.g. SEPs). It is a fundamental issue to understand the energy dissipation mechanism and, in particular, energy evolution across a collisionless shock. 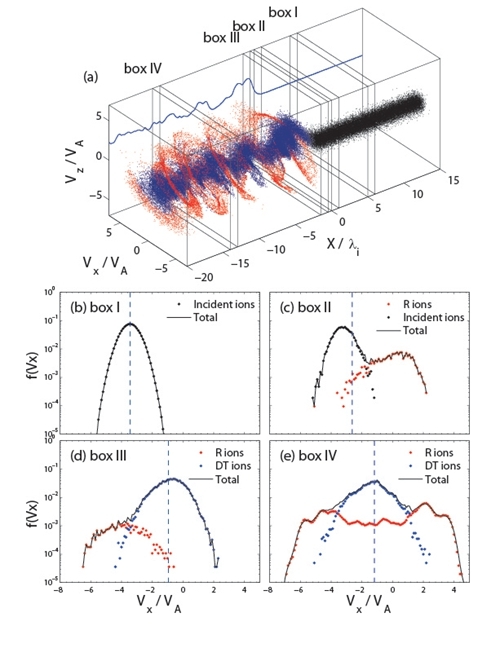 From a fluid point of view, Rankine–Hugoniot jump conditions can describe the entropy jump for the plasmas far upstream and downstream of the shock which is taken as a black box. However, it is not clear what causes the entropy generation within the shock front and how the entropy change is connected with the kinetic properties of the plasmas. Recently, using Cluster experimental data and a self-consistent PIC simulation model, YANG Zhongwei, LIU Ying etc. at the State Key Laboratory of Space Weather, the National Space Science Center (NSSC), revealed the entropy generation mechanism across a collisionless shock. The research group firstly present the comparison between Cluster experimental data and particle-in-cell simulations of such entropy across collisionless shocks. They concluded that (1) the ion heating at the shock is mainly contributed by the phase mixing of two subpopulations: reflected and directly transmitted ions;(2) Heating of electrons is a quasi-thermal process. For both species, there is a good consistency between observations and simulations on entropy generation across the shock;(3) The calculated entropy generation within the shock front is consistent with the estimated entropy jump by R-H jump conditions; (4) Furthermore, the research group found out that the entropy generation rate is reduced as the shock Mach number decreases. The research results are expected to help understand the basic physics of the dissipation mechanisms at collisionless shocks, and the relation between kinetic properties of the plasmas and the entropy generation. 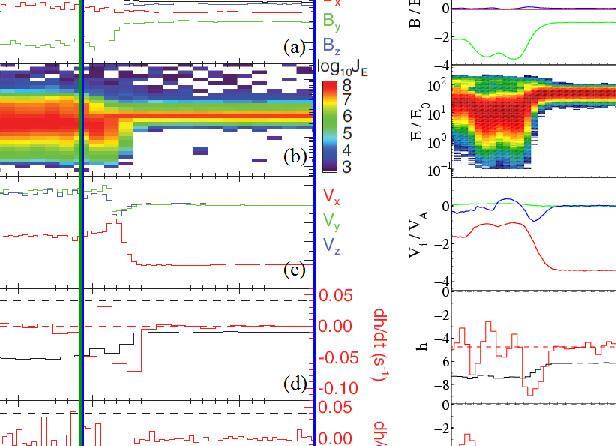 The work entitled Full Particle Electromagnetic Simulations of Entropy Generation across a Collisionless Shock was published on the Astrophysical Journal Letters (ApJL) hosted by the American Astronomical Society (AAS).